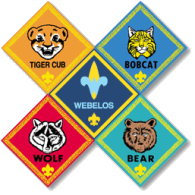 Per COPPA guidelines, Pack 888 is requiring authorization to put any images of scouts on our webpage. The images shown here will be what Pack 888 does best! (and that will be pictures of "Scouts BEING Scouts"!). Please fill out the form whether you agree to allow Pack 888 to use images of your child or whether you prohibit it (you can always change your mind later by just filling out the form again and changing choices). Please read the "Website Protection" link on the menu bar to the left for details. Thank you.